Guides are books of instructions, designed to systematize the quality of dialogues, meetings, or trainings. They may provide a theoretical background and an overview of key issues. Guides may be accompanied by scenarios for training simulations and other tools in order to help participants better understand training material in the context of real life decision-making. Global Health Insights has developed guides, training materials, and training scenarios for a number of organizations to help support participant acquisition of knowledge, abilities, and skills. 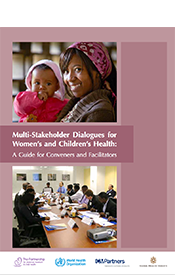 Global Health Insights and CMPartners worked with the Partnership for Maternal, Newborn, and Child Health to develop a guide for planning and facilitating multi-stakeholder dialogue for women’s and children’s health. The guide provides best practice, tools, and strategies for actors and organizations in the reproductive, maternal, newborn, and child health sector who want to know more about multi-stakeholder dialogue processes and how they can be convened and facilitated. As a supplement to the Guide, Global Health Insights also prepared a scenario on “community access to misoprostol for post-partum hemorrhage” for CMPartners to use in simulations in trainings for facilitators of multi-stakeholder dialogue for women’s and children’s health.